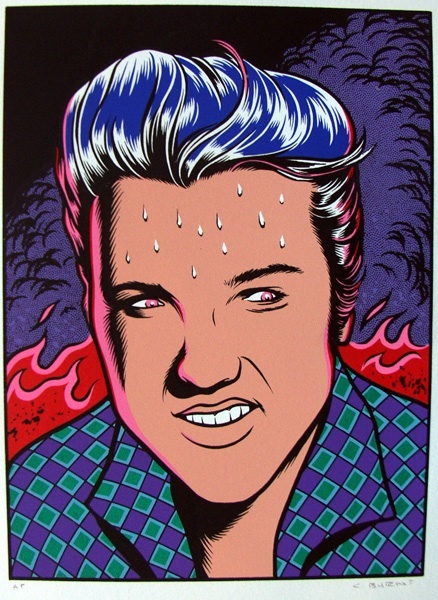 Best known for his freaky disturbing portraits of serial killers, monsters, Devils, and one particularly close to my heart of Elvis sweating in Hades, Charles Burns is one of those comic book artists that I don’t find embarrassing at all. His work has turned up in the New Yorker, on cola cans, and you might recall Dogboy from Mtv’s Liquid Television, if you remember that. If you saw ever saw anything he touched, it’s unlikely that you forgot it. With such an emphasis on the grotesque and the strange, you might not expect that the guy would have a cohesive, human story in him. He certainly does. Black Hole is about high school kids in the seventies who are suffering a sexually transmitted disease that leaves each of them disfigured. An allegory for the loss of innocence both personally and on the horizon culturally, as the free love culture between the pill and AIDS would soon be over. Cinematic and thrilling. Two words you don’t normally find in reviews of “alternative comics,” but Burns did it here. It’s the kind of thing that burns into your memory and will never leave. These characters will not leave you alone until you finish the book, every short chapter at a time, until you see who pays for their sins and who makes it out. And it certainly delivers. You should buy it, read it, and study it.I wish I could say that there were more like Burns, but there truly isn’t, and he works slowly and methodically, so there’s not so much out there of his work. Before Black Hole there was Big Baby, since Black Hole there’s X’ed Out, but neither holds the weight of this one book. It will almost certainly be his magnum opus. So start there. Or here, as it were.